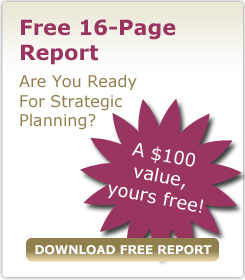 There is never a convenient time nor a better time to initiate a strategic planning process. Contact us to discuss how our process can deliver an experience that is both memorable and life (corporate and personal) changing. 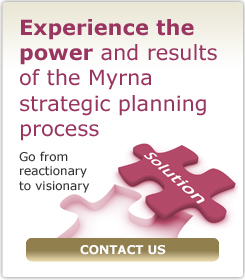 Myrna Associates enables you to transform the conceptual exercise of strategic planning into a tactical reality. You and your senior management team produce a complete and powerful Strategic Plan in only two days. More than that, unlike traditional strategic planning "experts" and their conceptual processes, the Myrna approach to strategic planning gets everyone to focus on what's really important, which results in proactively changing the status quo, not with a lifeless, bound summary, but with a proven implementation process that keeps people on schedule, on track, and regularly held accountable for 30-, 60-, and 90-day action steps. Our method has proven highly effective while remaining affordable and timely. With a fee as low as $8,500* for our core Silver Service and a 100% money-back satisfaction guarantee, you can feel confident in your decision to work with us. We initiate, supervise, and direct (subject to the authority of the CEO) all aspects of the strategic planning process leading up to execution of the plan. This includes soliciting and organizing the planning team's initial pre-meeting input, establishing a productive meeting environment, and getting everyone on the same page with regard to vision, mission, strategy, and strategic goals. We participate in creation of the plan from inception to launching implementation with initial 90-day action steps, including due dates and accountable parties. We document the plan in Microsoft Word and PowerPoint format. Within a week of the meeting, we deliver individual notebooks and CDs to each team member that include the plan, notes from all the discussions, records of input, and insights gained -- over 50 pages of valuable information. The CDs contain all working files, highlights of the plan, and photos of the planning retreat experience for each planning team member. Our Silver Service covers everything described above. The Silver Service creates the plan and implementation track, but as we know, for most organizations left to their own devices, this would be the equivalent of the "book on the shelf." We offer our Gold Service to ensure that you can "bring the vision to life and keep it alive." The Gold Service adds follow-up support with one-day review meetings and a launch meeting, including a planning tutorial, for the next level within the organization. For organizations that qualify, we offer a Platinum Service that integrates the input of senior and middle managers and adds a joint senior and middle manager tactical planning meeting that jump-starts implementation and personal accountability. We continue our ongoing support and relationship with annual planning meetings to close out the previous year's plan and regenerate a fresh, updated plan for the current year. Proven process with hundreds of enthusiastic testimonials -- a process that leads to renewed energy, focus, and incredible excitement and commitment. Affordable and predictable cost in dollars and time. All paperwork handled by Myrna Associates with professionally presented results delivered within a week of the meeting. Availability of facilitated follow-on presentations, reviews, and annual meetings to sustain momentum and implementation. A choice of professional facilitators you pick to match your organization's culture and needs. Each is highly skilled in producing productive conversations, facilitating the best team communication ever, and skillfully converting talk to action for breakthrough results. Each facilitator brings unique, relevant real-world and life experience to the meeting. A planning process that customizes itself around the unique issues of each organization while consistently providing the highly positive results you expect from a proven, formal process. Field-proven solutions to common business management and personnel problems presented as part of the discussion of issues. Two days and a fee of as low as $8,500 for the core Silver Service! And Myrna Associates guarantees your complete satisfaction with a 100% money-back guarantee. To arrange for a complimentary consultation to determine if the program is right for you and you are right for the program contact us or call us at (800)207-8192.